The SIGMA TELE CONVERTER is developed exclusively for the new lens lines. By mounting it in between a telephoto lens and a camera, the offered magnification of focal length of TC-2001 is 2 times times respectively. TC-2001 incorporates SLD (Special Low Dispersion) glass elements that offer excellent aberration correction. It is exceptional for a lens accessory to use one of the best glass materials, yet this is because SIGMA is seeking for the best image quality, and it is necessary to meet the new "SGV" standards. TC-2001 incorporates 2 SLD (Special Low Dispersion) glass elemenst. By minimizing chromatic aberration effectively, it has achieved very good optical performance, thus it is possible to maintain the optical quality of the original lens. All SIGMA's manufacturing – right down to the molds and parts – is carried out under an integrated production system, entirely in Japan. We are now one of the very few manufacturers whose products are solely "made in Japan". We like to think our products are somehow imbued with the essence of our homeland, blessed as it is with clean air and water, and focused, hard-working people. We pride ourselves on the authentic quality of SIGMA products, born of a marriage between highly attuned expertise and intelligent, advanced technology. Our sophisticated products have satisfied professionals and lovers of photography all over the world, because our manufacturing is based on genuine craftsmanship, underpinned by the passion and pride of our experts. Dedicated tele converters for use with only those SIGMA GLOBAL VISION lenses listed in the above chart and cannot be used with any other lenses. Cannot be attached to a camera and lens whose mount is different. Cannot be used in combination with another SIGMA TELE CONVERTER or other manufacturer’s converter. Only one tele converter can be used at one time. Please attach the TELE CONVERTER to the master lens first then attach the combined TELE CONVERTER and lens to the camera body. Attaching to SIGMA TELE CONVERTER to the camera body first may cause a malfunction and accurate operation is not guaranteed. Using the SIGMA TELE CONVERTER decreases the effective aperture by one F-stop (with 1.4x Tele Converter) or by two F-stops (with 2x Tele Converter). Although the exposure becomes lower, the operation is optimized. If using a lens which has in the list, the camera's display will indicate the converted exposure information. Auto focus can be used for the lens with AF mark in the chart. For those with MF mark, only manual focus can be used. Although the lens has MF mark in the chart, some lens can be used with auto focus but accurate operation is not guaranteed. Also, it may cause damage to the lens. Therefore, please use such lenses in MF mode when TELE CONVERTER is attached. *1 Requires firmware update to version 1.01 or later. *2 Requires firmware update to version 1.02 or later. *3 Requires firmware update to version 1.03 or later. 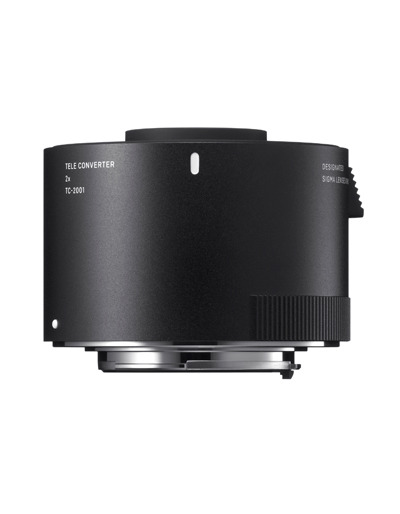 *4 In cameras with F8-compatible autofocus, SIGMA TELECONVERTER can be used with AF, but blurry images may result of subjects of low contrast or luminance.